Our team offer Bandwidth & Satellite Connections services to clients throughout our hemisphere. Since the year 2000 we have been offering full service to clients; full service means that we sell the equipment, we assist with installation and then supply the direct satellite connection from one of our teleports to the client site. 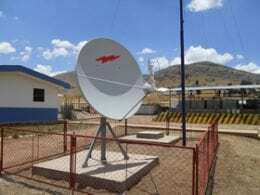 We sell Bandwidth & Satellite Connections throughout the continent of Africa and South America. Some clients require dedicated C-Band service, while others prefer cheaper shared bandwidth service, perhaps in KU Band. We service a wide range of clients with complete turnkey satellite communications, we evaluate the client’s needs, specify the equipment required and arrange transportation to the location. When requested we can arrange full installation and commissioning of the equipment. If we know your needs we can make recommendations to best suit your project. Contact us with your needs and let us provide you with a solution.